The next day as we continued to clear the mountainside by machete, axe and weed whackers the camp maintenance manager came down to ask if we wanted to play paintball that night. Of course just about everyone said yes, most of us having worked around the new courses hanging nets we got real excited when they told us we could play. They had us all geared up and ready to go after lunch. They had purchased 200,000 paintballs for the kids that would be coming throughout the year; we also got to use the guns they had just purchased. Originally they had told us we would be playing against the camp staff, but they ended up not being able to get away from their work. So we split our group up five verse four (one didn’t want to play) and went at it. The courses were very small so the games went quick. When you have so many people shooting at each other with paintballs most players get out in the first thirty seconds. But there was always that occasional one on one stand off where both players were afraid to come out of their hiding spots. 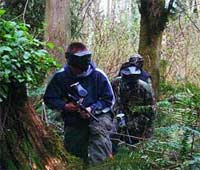 But there is nothing like the echo of paintball guns of the mountains, it made the guns actually feel powerful. I also thought it was funny how many precautions people take to avoid the pain of the paintballs. One of the guys on the trip was wearing three shirts and two sweaters; he looked like a bloated target running around. Regardless the game was awesome, we must have fired six thousand rounds in just less than two hours. By the time we were done we were all covered in paint and had the welts to prove we played. Half of us were talking about purchasing guns when we got home, but finding a place to play would be kind of hard in Central Florida. Regardless it was the highlight of our trip to Cahutta Georgia.